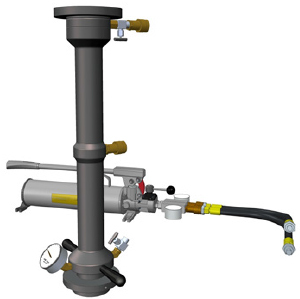 In conjunction with other parts of Metal Samples' High Pressure Hydraulic Access System product line (service valves, access fittings, plugs, and covers), the Hydraulic Retrieval Tool allows installation and removal of corrosion monitoring devices in systems under operating pressures of up to 6,000 PSI (41.4 MPa) and temperatures from -15°F to 400°F (-26°C to 204°C). The hydraulic retrieval tool is essentially an enclosed double-acting, 2-stage hydraulic cylinder. This design allows for safe and effortless operation at high pressures, as well as a relatively compact form factor. The hydraulic retrieval tool kit comes with a hydraulic pump (air or manual), and must be used with the hydraulic service valve (single or double isolation). When ordering, the retriever length must correspond to the appropriate probe length and service valve type. If required, the hydraulic retrieval tool can be used on standard 2” mechanical access fittings by using a mechanical-to-hydraulic fitting adapter. The hydraulic retrieval tools are manufactured from 17-4 PH stainless steel and have empty weights of 41 - 57 lbs. (18.3 - 26 kg), depending on the length of the tool.